The old Durham Bulls baseball stadium was the main location for Bull Durham, the 1988 romantic comedy sport film ranked one of the 25 Greatest Sports Movies of All-Time. The dust has not settled there, thanks to the Durham Farmers’ Market establishing itself on its ground in 1998 and adding to the community buzz. Having grown from its modest beginnings and currently located at Durham Central Park, the market focuses on the expanding community it serves. Durham is a great example of a listening market- one that is in tune with its components and open to new ideas. The market’s Nursery Tent was a grassroots effort that began with Sarah, a regular customer and mother. Sarah conducted a survey of 30 parents to find what would be helpful for parents at the market. The results were in and up cropped the Nursery Tent, equipped with a privacy screen, chairs, a blankets, and a feeding stool. Market staff proudly publicized the space and Sarah recruited Emerald Doulas, a local business, to provide financial assistance for the launch. Durham Farmers’ Market hits home runs with the community because they know a market thrives and exists upon community relations and input. We are very proud to have Durham in our Instagram lineup for the next two weeks, be sure to follow along! Farmers Market Coalition: Give us a little bit of history on your market. Molly Vaughan: The Durham Farmers’ Market has been offering fresh, local produce, artisan foods and handcrafted wares in downtown Durham since 1998. When we started, the market was little more than a few farmers and crafters in the gravel parking lot of the old Durham Bulls baseball stadium (fun fact- setting of the movie Bull Durham!). Through the tenacity of those early vendors (many of whom are still selling at the market) and the support of residents who saw the value of good, fresh local food and handmade crafts, we have expanded to more than 70 vendors. Back then, the Market had one staff member. Now, the Durham Farmers’ Market is run by a Market Manager, Assistant Market Manager, and Food Programs Coordinator. We also have some wonderful volunteers that do a great job helping keep things running smoothly on Market days. We require that all applicants and vendors grow or make everything that they sell and are located within 70 miles of Durham. We keep our vendor ratio at about 75% farmers and 25% prepared foods and crafts. Applications are accepted once per year for new vendors and we have three Markets: Saturday Main Season (April-November), Wednesday (mid-April through mid-October), and Saturday Winter (December-March). Farmers Market Coalition: Take us on a tour of your market. MV: The Market is outdoors at Durham Central Park in the downtown area of Durham. We are a year-round market. In the summer, we have a Wednesday market in addition to Saturday, and in the winter we keep shorter hours (10-noon) than in the summer (8-noon). During the summer season, we have vendors set up in the blocked-off street that cuts through Durham Central Park as well as vendors underneath the park’s pavilion and along the park’s sidewalk. For winter market, all vendors are underneath the pavilion. Durham Central Park hosts a craft market in a grassy area of the park next to our market every week, and there is a food truck and craft market on the street perpendicular to us that keeps the same hours. There are often non-profit information tables and events set up in the grass through Durham Central Park. All of this comes together to make the very vibrant and lively backdrop of our Farmers’ Market. Durham itself is also a city going through much growth and revitalization, so the neighborhood is continuously changing and developing. MV: We accept SNAP/ EBT benefits at the market and we offer double bucks for this (dollar for dollar up to $10). We have our Sprouts Kid’s Club, a cooking class for kids called Homefries, a nursery tent for parents to feed their children, live music, and a variety of other seasonal contests and activities. For example, we do a Collard Cook-Off in the winter with local chefs, Tomato Day in the summer, and a special Thanksgiving market the Tuesday before Thanksgiving. MV: We have a strong social media following on Facebook, Twitter & Instagram. We use social media to communicate nearly every day of the year and often multiple times a day. We write an article published in the local newspaper, the Durham Herald Sun, every 2 weeks. We have a weekly newsletter during the winter season and a twice weekly newsletter in the summer when our Wednesday market is running. We frequently put out flyers in the community. We have a chalkboard we put out at the Market to communicate important upcoming dates or events that seems to really do a good job of getting word out to customers. We work hard to keep good relationships with local chefs, Durham Central Park, advocates of local food in the community, and Durham citizens. We give out free stickers and bumper stickers at the info table at the Market which turns out to be great advertising for us. We go to events around local food and nutrition in the community and do school presentations whenever possible. FMC: When/how did the idea of market gleaning come up? MV: Thanks to the amazing dedication and commitment of two incredible volunteers, gleaning became a common practice at the Saturday Main Season Market in 2004. At that time, two volunteers went around to vendors at the end of the Market and collected leftover produce, which was then taken to the community cafe at Urban Ministries of Durham, a nonprofit that serves three meals per day to more than 250 people per meal. Over time, the gleaning program grew and nonprofits began collecting leftover produce after the Wednesday Market. Our vendors have huge hearts and are thankful for the opportunity to share their sustainably grown produce with others in our Durham community. MV: A challenge we are facing with our location is space constraint. We love our home at Durham Central Park in vibrant downtown Durham and we are so lucky to have so many long-term vendors, but we do not have much room for growth and with the growing population in Durham and tons of talented vendors and farmers interested in being a part of our Market, growth is in demand. Relating to vendors, it can be tricky to figure out how to make room for desired growth as far as vendors and product offering while maintaining the integrity of our market since we are currently a producer-only market and have a grown or produced within 70-miles rule. Product offering is a challenge with keeping customers enthusiastic about the Market, too. When we did a customer survey recently, we had a lot of customers express a desire to see North Carolina seafood at the market, but even if we had room for a seafood vendor to join the Market, they would not be within 70-miles and they might not be producer-only. Another challenge we face with keeping customers happy is parking. As Durham grows and developments are being built all around us, parking becomes more difficult and parking far away is likely to deter you from buying as much food as you would if your car was right there. Our successes are that our Market has grown so much over the years and we are seen as a leader in the local food movement in our community. Durham has become renowned for the many incredible farm-to-table restaurants, and the start of the farm-to-table movement here was only possible because of the Durham Farmers’ Market connecting chefs with area farmers. FMC: What do you think is key to nurturing a growing market? MV: There are a lot of factors that contribute to building a growing Market. First and foremost, it comes down to customer traffic and vendor attendance growing in balance. We are fortunate to have a great deal of support from the Durham (and entire Triad) community. This support did not happen overnight and took the commitment and dedication of our founding vendors who continually provided high quality products week after week. Over time, it was in response to this support and demand that the Market has been able to continually expand. Now, downtown Durham is growing at a rapid pace so in order to continue nurturing a growing Market, we have a dedicated Board of Directors and team of community advocates who help us remember the long-term vision and goals of the Market so that we can put our time and effort into growing to meet these changing demands. 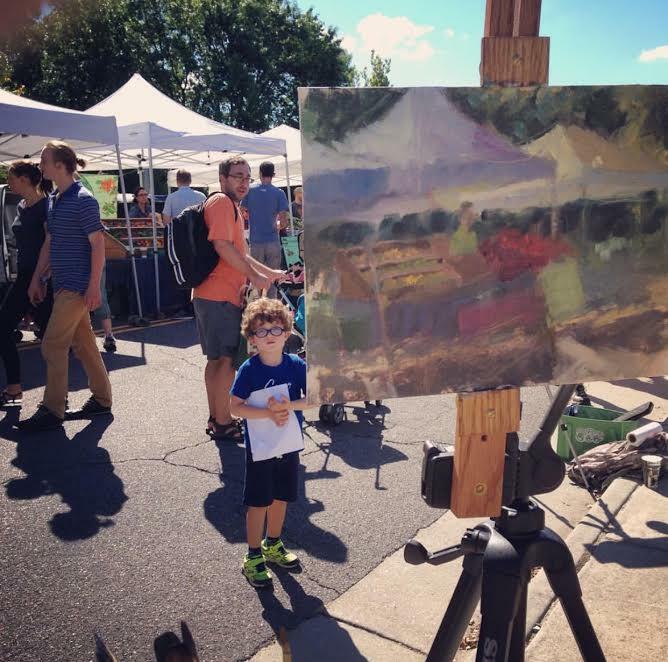 Durham is a vibrant city and the Durham Farmers’ Market has been fortunate to be one of the main pillars of our community. FMC: What, to you, is special about the market or your favorite part of being involved with it? MV: From our Market Manager: So many answers! For me, I was hooked from my first visit to the Market when I moved to Durham in October 2015. My first interaction at the Market was with Bernard Obie, who I now work closely with as he is the president of our Board of Directors. Obie spoke with me at length about the nutritional benefits of ginger root, the Durham community, and many other topics. I spent more than 20 minutes at his booth! I then enjoyed getting to know other vendors on that first visit and checking in with them on subsequent return trips. Our vendors are proud of their produce and very knowledgable about the products they bring to the Market. It’s so refreshing to learn from them and feel good about the food that nourishes my body. My relationship with our vendors is what will keep me coming back year after year and what always draws me to farmers’ markets wherever I am.